When she grew up, 5 decided to put an end to the name-calling. So, she created a weird spell. "Anyone who says '5' will drop dead,” she said. Then she changed her mind. “From this day on, anyone who says ‘5’ will disappear,"
front of the dumbfounded customer's eyes! rely on his brain to get whatever he needed to survive. He said to himself. "Things are tough, boy! 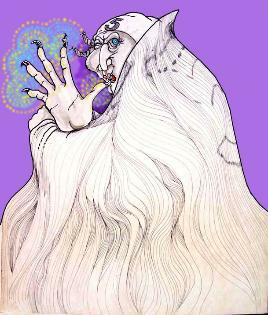 I must make this witch's spell work for me". could grow. 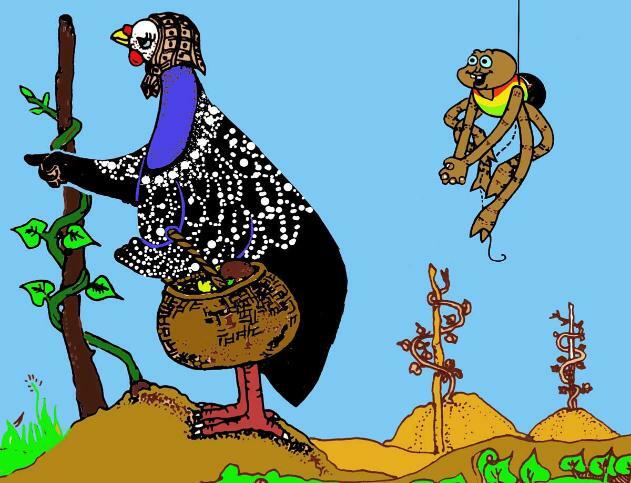 Anansi carefully watered the yams until each one began to sprout. 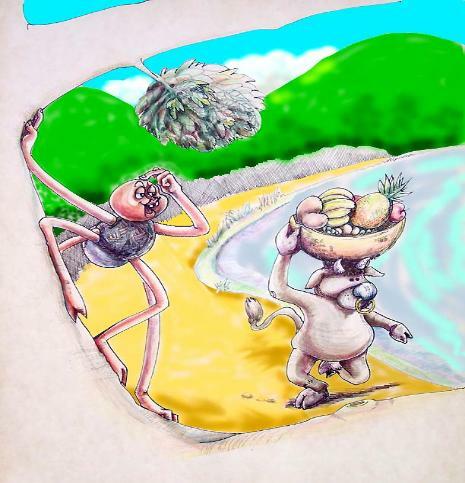 shoot had poked its head out of a mound, Anansi sat down next to his yam hills. Soon, Brother Dog came by on his way to the market. Dog balanced a bankra basket of sweet-smelling fruits on his head as he walked down the road. you. Would you help me to count how many yam hills that I have planted here?" Anansi asked. "You should have gone to school to learn how to count!" 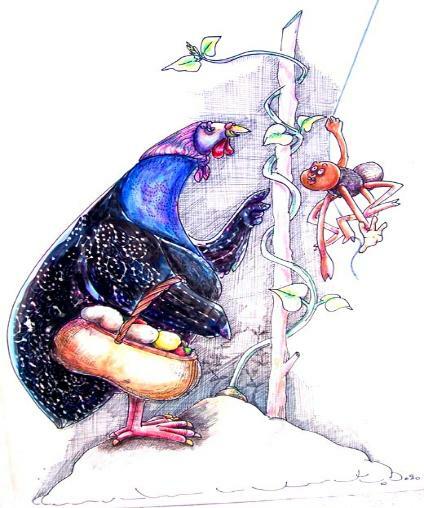 Anansi climbed up into the Guangu tree and waited. carried large basket of fruits on his head. "Good day Bro' Bull." Anansi said in a sad voice. "Could you just spare me one minute?" Anansi begged. "What can I do for you, Anansi?" Bro' Bull asked. send me to school. I never learned my ABC's. to count them?" Anansi said. "But, of course Anansi" Bro' Bull replied. "You have 1, 2, 3, 4, 5...."
As he said that number,Brother Bull disappeared into thin air. on his head, fell to the ground. gathered. He had tricked Brothers Turtle, Owl, Mongoose, Hare, Peenie-Wallie the firefly, and even the tough Bro' Scorpion. 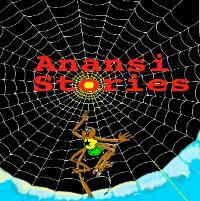 Anansi the spider lowered himself down from his perch in the Guangu tree. He called out in his sugary voice. "Good morning Mrs. Guinea Fowl. Could you help me with a problem?" "Of course Anansi". The polite Mrs. Guinea Fowl said. yam hill and climbed up on top of it. She said. “You have 1 ... 2 ... 3 ... 4 ... and the one I am standing on". "What! What are you doing? That is not the way you count!" "What do you mean, Anansi?" Mrs. Guinea Fowl said. "I don't know of any number called 'the one I'm standing on'. and the one I am standing on". "Well ... If you are so smart... What am I supposed to say?" with all the loot that he had gotten from tricking his victims. so fast and so much that it may sometimes choke? 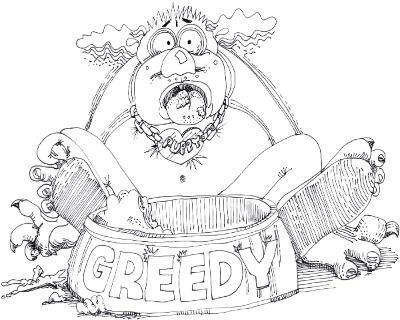 Similarly, it was Anansi's greed that got him into trouble. They would slap their hands with a quick handshake and burst out laughing. This taunting always made 5 angry.